I've seen this recipe floating around on a variety of blogs, and finally gave in and tried it. 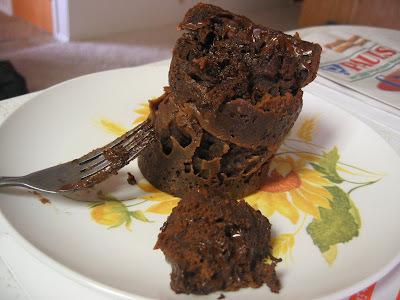 I have a microwave cake recipe that you make in a bowl, but I like this one better; it's more chocolatey. And it looks funnier too. I was having a rough time last night, so I made this cake (at 10:30 pm!) and ate it all up. And it was good. Today, I showed my sister how to make it. And it is still good. These pictures are of my sister's cake. 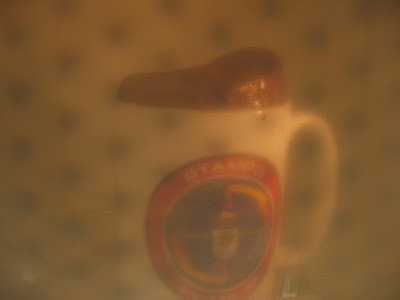 Measure flour, sugar, and cocoa in a large mug. Mix well. Add egg and mix well. Add milk and oil and mix well. Add chocolate chips and vanilla and mix well. Microwave for 3 minutes at 1000 watts. 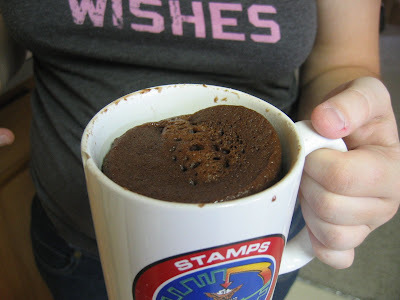 The cake will rise up over the top of the mug, but don't be alarmed. All the recipes said to not be alarmed when the cake rose. But my microwave is weird, and I was alarmed anyway as I watched my cake spill over and drip down the sides. But don't worry, a regular microwave won't have this problem. My sister's cake (made in my mom's microwave) rose properly and didn't spill or anything. Let cake cool briefly, and tip out onto a plate if desired. Then eat it! I have seen this on about 20 blogs this week. And I am not exaggerating. Everyone seems to be doing this right now. An emergency cake craving recipe sounds like an important recipe to have on hand. Thanks! Jeanette - I know I said I saw it floating around on several blogs. What I didn't say was that every single one of them was yesterday alone. It's like suddenly the popular thing to do! Come on, you know you want to make one - everybody's doing it! Michelle - I didn't know you wanted cake, but I know I did! This would be really good with toffee bits, I bet. Is this the same recipe that the crockpot lady used? How fun! 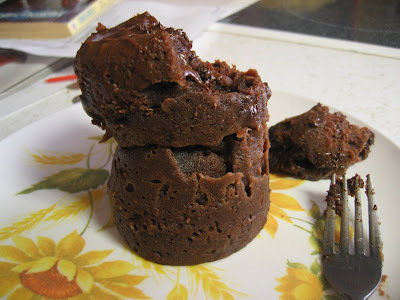 Nope - I checked, and hers is a Brownie in a Mug recipe, using brownie mix. It also looks really good - I might need to try that too! Hahah!How cool is this?! I just might have to give this a try!! BTW- I made this Thursday night. With a big scoop of vanilla ice cream! It was so good that I made it again for myself and a friend after lunch on Friday! I really love the idea of this. Just double it for 2 I guess! I just made this. I used brown sugar and extra-virgin olive oil (only thing I had around). It is really good! Very moist and tasty! I am wondering -- do you think this is doable for other kinds of cake? I guess it's pretty easy to exagerrate...I want to make a plain white cake or a lemon cake this way. Jess - sure, I think it would work. Just don't add the cocoa powder. For the white cake, I would do two egg whites instead of a whole egg (the yolk would keep it from being white). For lemon, just add a bit of whatever makes it lemon cake - lemon extract and/or zest instead of vanilla for instance. You might have to adjust the amount of flour to make up for the eliminated cocoa - just increase it a bit. Now I want to try it - Lemon Microwave Cake, yum! I've been seeing these around so much lately and have been tempted to try it but haven't..yet. Thanks for posting pictures of it! The pics seal the deal for me..yep, I'm going to try it! MMM! What about leavening? It really rises without baking powder or soda? This cake does have a different texture than one baked in the oven that uses leavening. 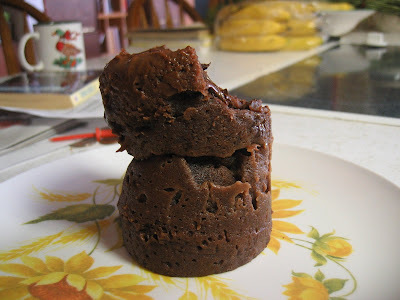 This cake is more heavy and rich, with the texture you might expect from a steamed cake. This is genius. I often want cake sometimes after dinner - say at 10pm, when all the bakeries in my neighbourhood are long since closed and I feel it's too late to start making a full blown cake. This is perfect for those occasions. And it tastes very good! I thought it was too sweet when I made it the last time, so I tried it again with 2 T of sugar and found it was easier to eat with less sweetness. Totally stumbled on your blog today, right to this recipe. Shared it with my friends in a project (linked to you, from here, I think my blog is private for now but if you'd like an invite let me know!) and am going to make it with friends tonight! Trying some with Bailey's, all with Pam in the cup. Maybe it's because I'm in Canada, but I hadn't even heard of this! I never know you could make a cupcake in the microwave. cool. I know I am a bit behide :b so I can't wait to try it! Thanks for posting and good tips everyone. nice work and thanks for sharing.i will try make cup cake. it came out nice and light and fluffy--not too lemony--or coconut-y either! Thanks for the inspiration! This even works as a Gluten Free treat if you use a GF flour. I've made it with rice flour and i've made it with tapioca flour--both with equally great results!! Welcome to my food blog! My husband and I are fairly tightwad, and generally try to spend as little money on food as possible. We enjoy the challenge of cooking for our family using inexpensive ingredients. On this blog, I share recipes for the delicious foods we prepare and eat without spending a lot of money! I'm a stay-at-home mother, with four young children and a loving husband. I like cooking and baking, playing the piano and organ, sewing, crocheting, building things, and reading.